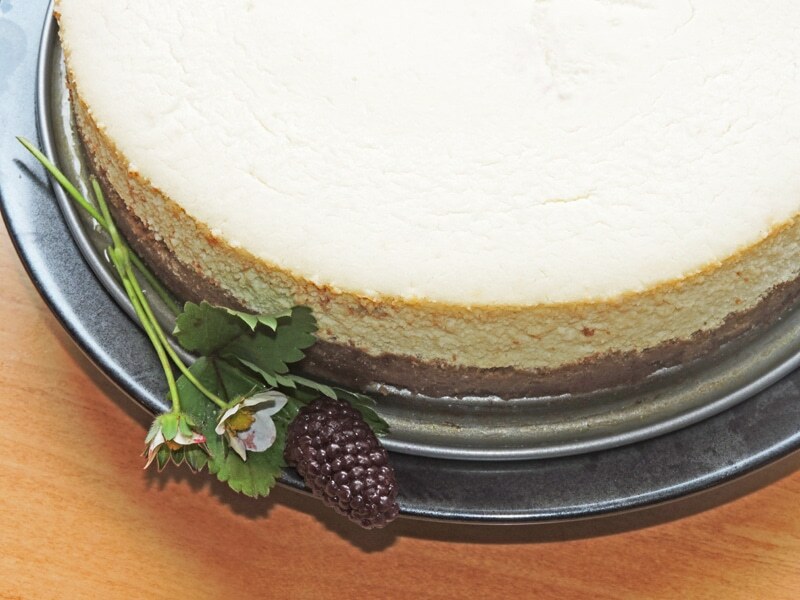 This is a very simple cheesecake with options for making it without regular cream cheese or chicken eggs. I’ve discovered that even though I react badly to everything from a chicken (meat, feathers, and eggs), and to dairy products from A1-type cows, I can eat other kinds of eggs and the cheese, butter, and yogurt from goats and water buffalo. Remaking this recipe took some trail and error, but it was so worth it be able to eat cheesecake again! Preheat oven to 375° F. Butter bottom and sides of a 9-inch springform pan. Wrap the outside of the pan with foil to prevent leaks. Place a folded dishtowel in the bottom of a roasting pan large enough to hold the springform pan to make a water bath. Make Almond Pie Crust mixture and press into bottom of pan. Bake for 8 to 10 minutes until lightly browned and fragrant. Remove and let cool. Lower oven temperature to 350° F. Put a kettle of water on to heat while making filling. Beat the cream or goat cheese with an electric mixer until smooth and fluffy. Beat in the sweetener. Add the eggs, one at a time, beating after each addition. Scrape down the bowl and beat in the remaining ingredients. Pour the filling mixture over the baked crust and smooth the top. Set the larger pan on the middle oven rack and place the cheesecake pan inside. Carefully pour hot water into the outside pan until it comes about halfway up the sides of the inner pan. Bake for 10 minutes. Reduce the heat to 275º F and bake for 1 hour longer, or until the edges are lightly browned. Remove the cake from the oven and run a thin, dull knife or skewer around the inside edge of the pan to minimize cracking as the cake cools. Return to the oven and turn off the heat. Let cool for 1 hour in oven. Remove cake from oven and run a knife around the inside edge again. Loosen the rim of the springform pan, but leave in place. When completely cool, cover cake loosely with foil or set a plate on top of the rim and refrigerate for several hours or overnight. Remove sides of springform pan. Serve with berries and sugar-free whipped cream if desired. Nutrition data does not include sweetener, which has little impact. 2. **My local Costco sells fresh goat cheese at a good price. It comes in a twin-pack of two 10½-ounce logs. I used three logs (31½ ounces) for this recipe. Goat cheese is a bit more crumbly than cream cheese, so adding xanthan gum makes a smoother cake that is easier to slice. 3. ***I used ¾ cup of Natual Mate sweetener to make the cake in the photo. Natural Mate is twice as sweet as sugar and contains erythritol plus a high-intensity sweetener (stevia or sucralose) so you only need half as much. If you use Swereve or another erythritiol blend, use the full 1½ cups. Granulated erythritol will need to be powdered in a spice mill, coffee grinder, blender, or a food processor before using. Some blends, such as Swerve and Sweet Perfection are already powdered. 4. ****I use duck and quail eggs to substitute for chicken eggs. (Goose and turkey eggs could also be used if you can find them.) One large chicken egg weighs 2 ounces so 4 eggs would weigh 8 ounces. Duck eggs can be similar to chicken eggs in size, but if they are much bigger, you may need to weigh them. Weigh enough duck eggs to get as close to the amount you need as possible without having to use part of an extra egg, then add quail eggs as needed. By using duck eggs like dollars and quail eggs like small change, you can get the exact amount. 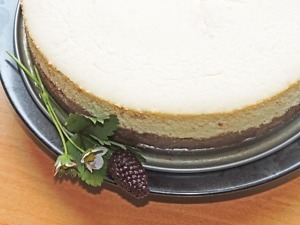 Cheesecake, Dairy allergies, Egg allergies, Simple recipe. Bookmark.